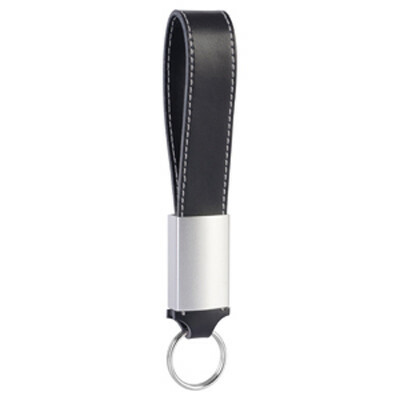 Features: A thin USB key chain in genuine leather with aluminium plate. Very portable due to its thin size and useable as a keychain. Including 16 mm split ring. Grade A memory, 10 Year warranty on data retention, 1 year replacement warranty on faulty manufacture. Certification: CE, FCC, USB2.0, RoHS. Product Colour: Black, Brown, White. Product Size: 117 x 20 x 10 mm. Print Area: 40 x 10 mm (leather strap) 25 x 13 mm (metal plate). Print Process: Pad Print, Laser Engrave, Debossed. Delivery: 2-4 weeks (indent) from art approval. Standard Packaging: PSL Design Box. Packing Details: 100 pcs per carton, 1 Kgs, 30x22x10 cms. Setups: Included.